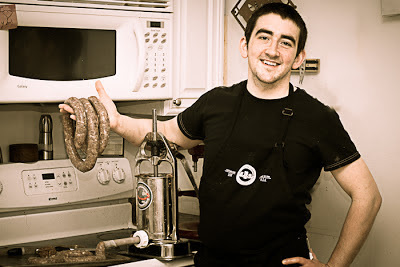 If you’ve been following my blog for a bit on meat curing, you notice the reoccurring theme of my frustration with the KitchenAid sausage stuffer. I love the meat grinder attachment, but the stuffer seems to overwork and knead the meat together, making me lose the definition I had striven for. Instead of getting a nice blend of meat and fat, everything just gets smushed together, even starting with well-chilled ingredients. So I stopped hitting my head against the wall and made sausage using alternatives that don’t require me to use the sausage stuffing attachment. These include caul fat casing and hand stuffing into a beef bung. But this Christmas my parents gave me the wonderful gift of a 5 lb capacity sausage stuffer from The Sausage Maker in Buffalo, NY. Honestly, when I first got into butchering and sausage making, I thought these machines were kind of silly. But after making several batches of sausage and never being pleased with the texture, I understood the need for a machine like this. By means of a hand crack, the stuffer slowly applies steady force to the ground meat, without additional mixing, churning, or warming of the meat. So with a freezer full of beef and a fistful of hog casings, I was ready to go! For my initial test run, I was eager to get another batch of salami curing in the closet. This salami is made of grass-fed beef we bought from a friend of Carla’s father. I trimmed all the beef fat and sinew away, and kept the fat content much lower than I normally would for a cured salami. Carla asked for a leaner product, so I added a small amount of diced pork fat, making up less than 10% of the weight of the mixture (compared to 20%+ normally for cured salami). This mixture was then seasoned with garlic, red wine, black pepper, and a small amount of allspice. 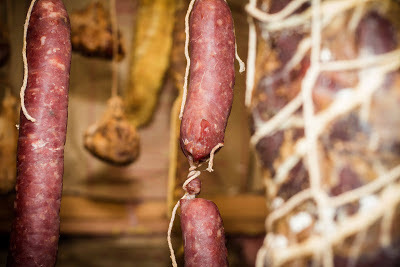 Like my previous salami, the casing were inoculated with a white mold. But I read that you can get faster and more complete coverage by soaking the casings in dextrose sugar, along with the mold spores. This helps put a sugar slick on the casings, giving the beneficial mold a boost to start growing. Now all I need to do is wait 5-6 weeks and see how things are looking.